640 First mention in the Liber Landavensis of a ‘church’ here in 640. See the articles page. 1056/1087 Bishop Herewald consecrates 17 churches in Ergyng, including Llan Dewi Cilpedec, probably between 1067/1071. The name Norman is in some dispute as it was probably used as a sobriquet. William the Norman becomes William fitzNorman, and his son Hugh becomes Hugh FitzWillaim FitzNorman, and eventually just Hugh de Kilpeck. 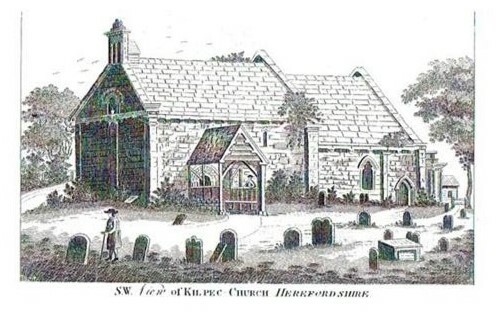 The Pye family history has some fascinating details of the early Lords of Kilpeck. See more under the Articles heading. By 1259 Kilpeck possessed a weekly market and annual fair. The population of the village unknown but likely to be as many as 600. Thus it could have been on a par with Harlech and Wrexham (Shoesmith) Note that it even had its own defences, independent of the castle. 1130 Appropriated by Hereford from Llandaff. 1134 Benedictine cell at Priory Farm after the church of St David and the chapel of St Mary in the caastle was ‘given’ to Gloucester Abbey to house monks displaced from Llantony Abbey. 1200 King John gave John de Kilpeck, Hugh de Kilpeck’s grandson, and his heirs the Bailiwick of all the forests of Herefordshire for ever. 1204 John de Kilpeck dies and son, another Hugh, inherits, but as he is very young, William de Cantilupe, Sheriff of Herefordshire is appointed by King John to take control of the Kilpeck estates. 1211, 1213, 1214 Castle visited by King John. Wm de Cantilupe is still i/c the estates when he hosts the visits of King John. 1248 Hugh de Kilpeck dies leaving 2 daughters as heirs. The eldest daughter Isabella marries William de Walerand taking Kilpeck as her dowry. out issue, Kilpeck passes to his sister’s son, Alan de Plugenet. 1320 A commission to arbitrate between Sir Baldwill de Trevville and the Prior of Kilpeck over the jurisdiction of a chapel/chantry in the forest of Treville. It is from this chapel that the stoop is supposed to have come. 1327 Castle and lands into the possession of absentee landlords, following the withdrawal of the garrison, contributing to the decline of the area. At this time there were also three years of famine, causing further demise of the viability of the area, three events that helped to contribute to the church’s survival unchanged. 1348/9 The Black Death reduced population in England and Wales by as much as half. This meant that there were few workers to work on the land, there were perhaps 40% fewer priests which meant the dead could not be decently buried. The tenth part tithe could not bring in sufficent funds. This contributed to the lack of viability of the church, since it was preceded by three years of virtual famine. The demise of the castle and its passing into the hands of absent landlords all contributed to the ultimate survival of the church unchanged. 1391 In papal records a reference to the Benedictine Prior of St David’s Kilpeck. Note dedication does not contain St Mary. 1467 Kilpeck reverts back to the Crown. King Edward IV grants Kilpeck to his faithful soldier William FitzHerbert, who is captured in battle and beheaded. King Edward restores Kilpeck to the Butlers, who had inherited in c 1325. 1530s The castle recorded by Leland as being in ruins, but it was sufficiently sound to be garrisoned during the English Civil War(1642-51). Supposedly slighted by Parliamentarians after the end of the conflict c1645. 1643 From a parliamentary survey: The impropriate rector of Kilpeck, George Mason, ought to find a curate; there is none serving the cure. And two years previously the curate was a very scandalous person! 1650 Lease of the Priory to Epiphan Howarth. This was a very profitable post since it was possible to pay for a priest out of only a fraction of the tithes that had to be paid by the populace. With reference to this a parliamentary survey in 1650 revealed that George Mason occupied the farm which consisted then of one parlour, one kitchen and three upper rooms, all in good condition. 7th C Kilpeck passes to the Pyes of Sddlebow and the Mynde. C1760 The Priory became part of the Whitfield estate, having previously belonged to the prestigious estate of the Pye family, one of whose forebears is reported in the Pye family records as having rebuilt Kilpeck church. 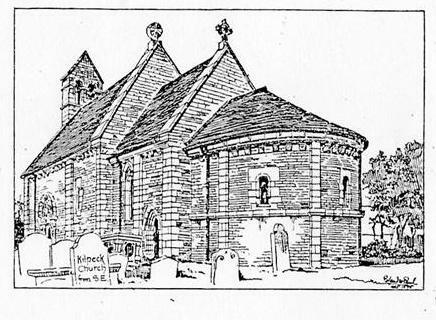 1789 From an article in the Gentleman’s Magazine of September 1789 of the visit of Mr Wathen who said the church was much frequented. Although the church has no monument, the building has much to recommend the admirer of Saxon architecture. I have the satisfaction that this church…..are in a state of reparation and improvement. There were monuments in the way of plaques to the Gomond family. If improvements were taking place, why was there a bush growing in the gutter!? 1842 Illustrations of Kilpeck Church in a series of drawings made on the spot with an essay on Ecclesiastical design and a descriptive interpretation by George Robert Lewis. This the first recorded publication about the church. The condition of the church reported as being very poor. See some of his interpretations under Articles; some are rather fanciful! 1864 Apse refaced and roofline lowered by Cottingham (there were two Cottinghams and there is some confusion as to the date(s) they each worked here) and and further work in 1868 and even later. 1849 Windows donated by Rev Archer Clive, designed by Augustus Pugin. 1898 Font moved from the chancel to its present place. Porch removed. Drain placed all round the exterior. West window reglazed. Stone tile roof relaid. Reopening of the church reported in the Hereford Times; attended by the Bishop. The article says that, during the works, the interior, which had been much disfigured by a thick modern coat of plaster has been carefully replastered. No fresco painting was found, this having been probably destroyed in former times, but a small fragment of colour was found on the north side of the chancel. The repairs have been carried out under the superintendence of Mr Roland Paul. His drawing of the church at that time is the most accurate. Note that G.R. Lewis had reported that there were frescos in 1818, which he had not enough time to copy. 1828 Kilpeck area reverted from the Mynde to the estate of the Clives of Whitfield. 1978 Font stopper, missed from the church in 1974, returned by Dr Peter Harbison of the Irish Tourist Board. Dr Harbison had been given it by a tourist who had found it in the river Usk. 1962/63 Lead mantle placed over the south door, after much debate as to whether another porch should be built. Roof retiled, interior replastered with damp proof material, oak floor laid on new joists, west window reglazed, knapen syphons inserted all round. Financed partly by an appeal on The Week’s Good Cause. 1999 Nigel Slater repaired the nave windows free of charge. The nave side of the chancel arch stripped of plaster to enable drying out to take place. 2003 Michael Eastham repaired the heads on west end and the later king and queen heads over the south side chancel window. 2005 to 2012 Repointing of the exterior of the church with the correct lime based mortar. 2006 Chancel side of chancel arch stripped of plaster. 2010 Monitoring of the south door eventually abandoned; no computer at Birmingham University powerful enough then to compare images to the required accuracy of 0.5mm.